For a turquoise blue themed wedding this is the one for bridesmaids. A design that sings Greek Islands and especially the beautiful Mykonos, that’s for sure. We can see this, in a wedding with a Mediterranean or nautical theme also. With generous amounts of chunky sterling silver spacers and endings, this little number will be for ever popular and worn for so many years to come. With that Greek flavour, in our opinion this should be worn on dewy olive skin. Holiday here and dream of the Mykonos ! Alert! The matching Mykonos Too Earrings are about to be added shortly. Just wait and see making it into a set will be stunning! 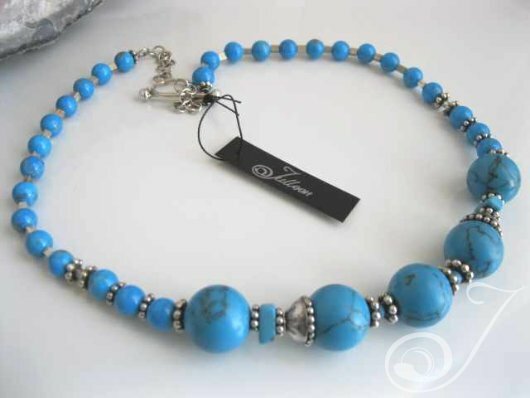 Divine Turquoise with silver, there’s nothing like it.